Why are techies so obsessed with teardowns? Because they’re damned cool, that’s why. You may think you’ve seen them all if you’ve seen just one, but there’s always something new and unique about each and every device when you go beneath the hood. In the case of the Samsung Galaxy S5, it seems Samsung made it dead easy to get to the battery, but repairing and replacing anything else could come with a bit of trickery. The display, first and foremost, uses tons of adhesive that makes it difficult to remove without damaging the display or wires. 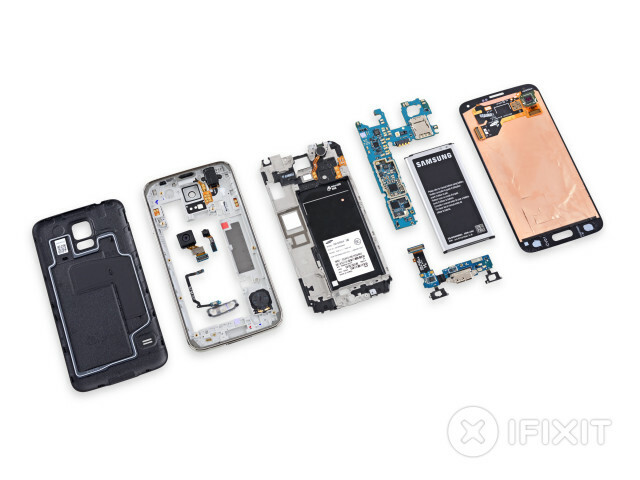 If that’s not enough, a vast majority of the components are only accessible by removing the display, so think of it as a tough barrier of entry to do anything worth anything should your phone suffer a fate worse than declining battery performance. All of that led to a repair score of 5/10, with 10 being the easiest to repair. There’s a good thing insurance exists, and you will definitely want to get it if you’re buying ANY phone worth hundreds of dollars. The device is available tomorrow, so you still have a bit of time to think about which route you want to take.